Gulf Crane Services, Inc. was awarded the 2016 Louisiana Workers' Compensation Corporation (LWCC) Safest 70 Award. In order to continue to provide quality service we have enhanced safety standards, quality management improvements and continued training in all departments i.e. API Standards, API Monogram, API Certifications and, SEMS II implementation. Congratulations! 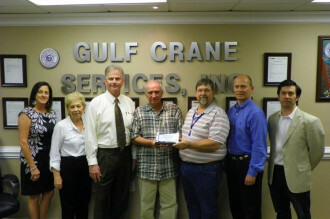 LWCC is pleased to recognize Gulf Crane Services with the LWCC Safest 70 Award. This award acknowledges excellence, outstanding performance and commitment to workplace safety. Companies are recognized based on the effectiveness of their safety efforts in preventing injuries and controlling costs. Through your achievements in loss prevention, you not only accomplish much for your own company, but also for your employees, other policyholders, your industry and LWCC. We are deeply appreciative of the integrity and efforts by Gulf Crane Services in achieving these goals. Your agency, Louisiana Companies and LWCC are proud of your work and will continue to recognize similar company efforts in the future. LWCC presented the 2016 Safest 70 Award to 70 of our approximately 26,000 policyholders, acknowledging exemplary dedication and commitment to workplace safety. These companies were recognized based on the effectiveness of their safety efforts in preventing injuries and controlling costs. Gulf Crane Services was also awarded in '2013 a consecutive five-year LWCC Safest 70 Award. Only five of the 26,000 policy holders have ever achieved this standard.